Wired and Wireless Versions Escalate your iPod to your entire home with the NuVoDock for iPod. Now you can listen to your iPod collection from any zone in and around your home, through your whole home audio system. Six Sound Source, Eight Listening Zones NuVo’s latest masterpiece is an elegant, intelligent whole home audio system that combines our proven performance and the industry’s most innovative technology with class. Order #: 139-000012 NV-M3-160 & NV-M3-500 - Music Servers Designed for homes of the future, the M3 is the first in-home music server of its kind with full Digital Rights Management compliance. Six Sound Sources, Six Listening Zones The Essentia delivers the startlingly clear sound of NuVo from up to six different sources, and to six different listening zones in the house. Big Sound, Small Impact Radio enters the twenty-first century with the T2, a revolutionary family of dual tuners from NuVo. 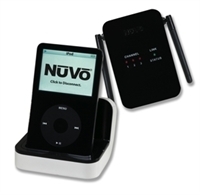 Wired and Wireless Versions Escalate your iPod to your entire home with the NuVoDock for iPod.